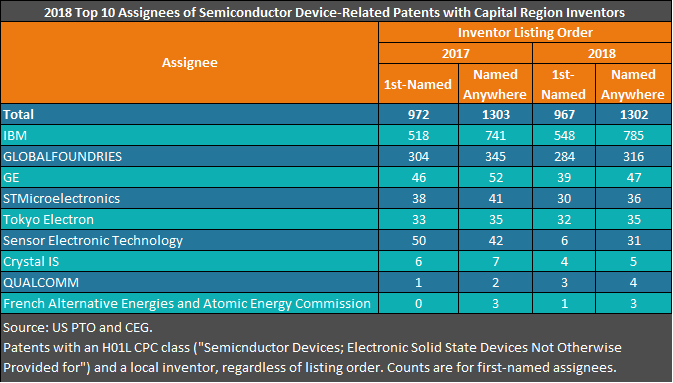 Capital Region inventors continued to increase their share of semiconductor device-related patents issued nationwide in 2018. Last year, 1,302 of the total 25,170 semiconductor device-related patents issued by the U.S. Patent and Trademark Office (PTO) listed a Capital Region inventor. That means that 5.2 percent of all U.S. semiconductor innovation could be traced to the region, compared to 4.8 percent in 2017 and 4.1 percent the year before that, according to a Center for Economic Growth review of patents listed in PTO’s Patent Full-Text and Image Database. Out of the 1,302 semiconductor device-related patents listing a local inventor, 967 featured first-named local inventors – usually a position for people primarily responsible for the innovation. These are patents in the Cooperative Patent Classification (CPC) HO1L class, which primarily covers semiconductor devices but also covers otherwise unclassified electric solid state devices. Regional semiconductor device-related patent growth was flat for the year, though it may have been slightly higher had the federal government shutdown in late December not impacted the issuance of patents. The region, however, still managed to increase its share of this type of innovation due to a 6.9 percent decline in total semiconductor device-related patents issued. Capital Region inventors last year were listed on patents assigned to 37 firms and institutions, compared to 33 in 2017. For some of those assignees, local inventors were collaborating partners in the innovation rather than employees. The drivers of the region’s semiconductor device-related patent generation were IBM and GLOBALFOUNDRIES. Compared to the previous year, IBM saw a 5.9 percent increase in such patents to 785. Offsetting that gain was GLOBALFOUNDRIES’s 8.4 percent decline to 316. Other leading assignees of semiconductor device-related patents with ties to local inventors included General Electric, Tokyo Electron, and Sensor Electronic Technology. Local assignees of H01L-classed patents issued last year included Crystal IS, Rensselaer Polytechnic Institute, the Research Foundation for the State University of New York, ThermoAura and Vital Vio. Representing the Capital Region at six semiconductor/nanotechnology conferences worldwide in 2018. Participated in the second annual Business Connection Forum in Germany, hosted by, Silicon Saxony, which aims to foster smart systems partnerships between American and European advanced electronics companies. Hosting the GSA Silicon Summit East, attended by more than 150 regional and industry leaders, in conjunction with Saratoga County Prosperity Partnership, Global Semiconductor Alliance and other regional partners. Co-sponsoring the Semiconductor Industry Association’s annual awards dinner in San Jose, California for 17 consecutive years. Commissioning a Georgetown University study on the economic impacts of New York’s investments in its nano-cluster. Supporting the development of an industrial advisory board and recruitment of former GLOBALFOUNDRIES CEO Doug Grose to serve as director of New York Center for Research, Economic Advancement, Technology, Engineering and Science (NY CREATES) to manage industrial and business relationships at the SUNY Polytechnic Institute.